When we first hit the road, we invested in a Yeti cooler to keep our food and drinks cool. That worked for a little while, but given our constant opening and closing to access food and drinks we quickly learned that a fridge was in our future. So we said goodbye to Yeti…but just for a little while. Fast forward a few years and Yeti has expanded their deliciously over-engineered product line to include some dope drinkware offerings in addition to all the different coolers they offer now. With very limited space for such luxuries in the van, it was time to make some changes. I wasn’t particularly in love with the hodgepodge of cups we had collected during our time on the road so in order to make some room for these more functional (and attractive) vessels I had to cull the herd. I cut down our Khordz mugs from a set of four to a set of two (painful! ), got rid of some random ugly plastic camp cups and replaced them with a couple 20oz Ramblers, 10oz Rambler Lowballs, and a Rambler Colster to keep my hard cider habit nice and cool. While we initially tried out the 20oz Rambler Tumblers, we decided not to keep them because of the limited space we have in our kitchen cabinet under the sink in the van. They have many of the same features as the Lowballs so I’ll go straight into my thoughts on the Lowballs since those were the cups we decided to keep. The 10oz Rambler Lowballs by Yeti are sippy cups for adults. Seriously. Without even considering the fact that they are super functional and do an incredible job of keeping your Gin & Juice cold and your Herbal Tea hot without making your hands the same temperature as your drink, these cups are an actual pleasure to drink out of. I love their squat posture, the smooth texture of the stainless steel (that never gets sweaty! ), and that plastic lid that keeps the spills at bay while regulating the perfect flow of libations straight down your gullet. Both the cup and lid have proven durable and easy to clean even with daily use on the road. Holy crap y’all, where have koozies been all my life!? For some unexplained reason, I’ve never owned one. Apparently I decided to go straight to the top with the Yeti Colster. Anytime I crack open a cold one I make sure to wrap it in the loving, albeit hard and cold, arms of my Yeti Colster. The Colster uses the same double-wall vacuum insulation as the Ramblers so your drink stays cold (and I mean cold!) for an impressively long time. Additionally, again like the Ramblers, your hand is saved from both the cold and the weeping that takes place as your drink warms. No more soggy wet fingers as you try and enjoy your rapidly warming booze. The Colster fits both cans and bottles and has a handy dandy “Load-and-Lock” Gasket top thingy that screws on once your drink is in place to make sure it stays there. Again, this product has proven durable and easy to clean since we’ve been traveling with them for the last six months. Bottom Line: I am super happy with our drinkware in the van now between the Khordz mugs and the Yeti Tumblers and Colster. 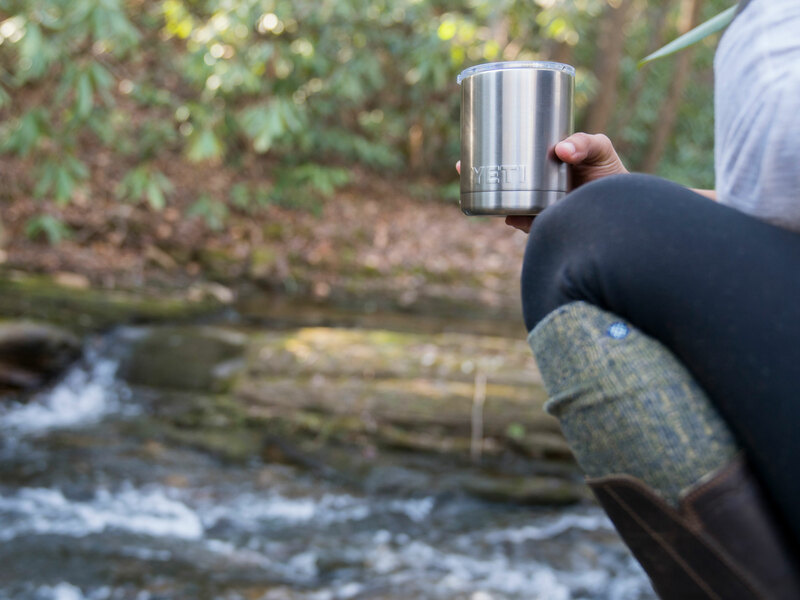 I’d definitely recommend investing in these Yeti cups if you’re looking for a daily driver for your coffee or tea or night cap…or whatever you drink on a regular basis. Two hitchhiker’s thumbs up from this gal. Jessica is an illustrator and art director who lives on the road full time with her husband and two pups. She grew up as a military brat and spent a short time in Panama as a youngster where she eagerly observed leaf cutter ants and the local battalion of three toed sloths. Nowadays, when she's not sharpening the blades of her knife collection you can catch her chasing around some animal or other, snapping reference pics so she can sketch them later.